Boerne may be a small Hill Country town just north of San Antonio, but it has numerous community events that just about anyone will enjoy. These include a grand German festival, a classic Corvette car show, and a county fair. Discover the many events in Boerne below. The Boerne Chocolate Walk rewards you just for shopping! Each time you visit a store in downtown Boerne, you’ll receive a chocolate treat. Visit all the shops in the area and you can enter a raffle to win a great prize! The event occurs on the second Saturday in February. Tickets are available online starting the month prior to the event and are limited. Downtown Boerne is taken over by an army of classic cars during the Texas Corvette Car Show, usually held in mid-April. The event includes a classic car contest and the Hill Country Run, a driving tour of the scenic Texas Hill Country. Hundreds of carefully crafted hand-made quilts comprise the Hauptstrasse Quiltfest, an annual event that takes place in Boerne’s main plaza. Exhibits of antique, patriotic, and modern quilts add a wide spectrum of color to the event, typically held the first Saturday in May. The Boerne Berges Fest is an annual celebration of the town’s German heritage and culture. German folk music, a bratwurst eating contest, a parade, dachshund races, carnival rides, and more comprise the festival, held on Father’s Day weekend. Carnival rides and a livestock show and rodeo make up the Kendall County Fair, an annual event held over Labor Day weekend. Numerous food and craft stands, heritage exhibits, a parade, and live music are just a part of what makes the festival one of the biggest in the Hill Country. Artists from around the state are invited to display their paintings, photography, pottery, and mixed media at the Texas Hill Country Invitational Art Show in Boerne. The event, held in the Cana Ballroom at St. Peter’s Church is free and open to the public. The Key To The Hills Rod Run is one of the most unique car shows in the country. That’s because this annual event only features coupes, sedans, and roadsters from before 1949, making it a gathering point for some of the rarest cars around. The festival is held along Boerne’s Main Street in early October. All British Car Day in Boerne is a celebration of British automobiles. It includes a contest in which participants vote for their favorite cars, and awards are presented to the most popular vehicle in each class. 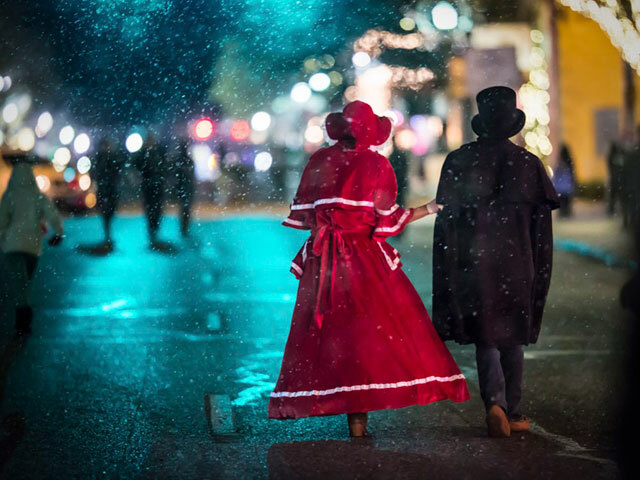 In the two days after Thanksgiving, downtown Boerne is transformed into a holiday wonderland during the popular – and long-running – Dicken’s on Main. Browse the wares at the Artisans Market & Food Court, or play in the snow in North Pole Plaza. Then take your little ones to craft their very own bird seed ornaments or to the petting zoo in Santa’s Workshop. Live music, ice sculpting shows, and visits with Jolly Old Saint Nick himself are part of the festivities as well. Shop for one-of-a-kind Texan items at Oma’s Christmas Craft Fair in early December. Hand-crafted wood items, clothing, ceramics, knitted goods, and homemade jellies are among the items you may encounter at the fair.